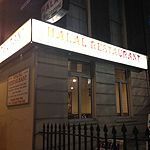 Halal Restaurant boasts a wide range of traditional Indian meals served in a friendly atmosphere. Do you work at Halal Restaurant? What did you think of Halal Restaurant? Halal Restaurant has some of the rudest waiting staff I’ve ever encountered. I’m sorry me and my partner wanted to give you money to eat at your restaurant to keep your business going, but would a smile have killed you? In fact, would the use of any pleasantries whatsoever have been too much to ask? Halal Restaurant = avoid. I've been eating at the Halal for over 20 years (my dad over 40 years). The deco may be dated but the staff are very friendly and the food is awesome. The food really sets the Halal apart from its competitors. Every dish has a very distinct, authentic flavour and these flavours are never drowned out regardless of the 'heat' of the dish. I would recommend the plain mutton curry as a great place to start. What could be a bland, bog standard dish is one of the highlights in terms of flavour. The Karahi chicken and Tikka dishes are also very very good but to be honest there are so many excellent dishes on the menu. On top of the excellent food the value is incredible. A firm favourite that has maintained it's standards for many decades. Thoroughly recommended. I have been eating at The Halal restaurant since 1990. The food is wonderful and I have never found another Indian Restaurant in the whole of London to compare. The waiting staff are always polite and extremely friendly and I am always warmly greeted when I visit there. I have introduced numerous friends to the Halal and they always rave about the wonderful food after a visit. I would highly recommend all lovers of Indian food to visit this wonderful restaurant. You will not be disappointed. I've used the Halal Restaurant for over 25 years and the staff at the Halal Restaurant have always been polite and the food, immaculate.